Sugar is so emotionally addictive. We crave for it when we are happy, sad, upset, bored…or is it just me?! However maybe I have a strong will power cause I never chew on chocolate bars or fudge or something like that out of packet. Evil sugar can modify your genes I reckon. If you grow up with it at earlier age, it is hard to kick the habit and you get withdrawal symptoms when stopped. I personally didn’t have much sweets when I grew up in Korea (thanks mum, love you loads!) but I’ve seen parents here giving kids sweet foods for either rewards or bribe. Not to mention, you often see huge cakes drenched in sugar and heaps of lollies in kid’s birthday parties. Kids do not need that much sugar, or anyone really! For us, grown-ups, not only your health but your beautiful skin gets compromised. Excess glucose from the sugar binds to the skin’s protein and turn them brittle and stiff and cause cell inflammation. So skin appears to be dull and aged. It is hard to live a sugar-free life though since sugar is all hidden these days (watch out for fat-free products!). If you buy fresh fruits and vegetables and cook at home, you are pretty safe from these bad guys. When you feel like something sweet? it is okay, don’t be too harsh on yourself. Just make a healthy snack with natural sweetener such as maple syrup, honey, coconut sugar, stevia, molasses which are my favorites. Your body will appreciate it with more energy, slim waist line, healthy hair and skin, better sleep and just happiness. Well..just my thoughts on sugar anyway. 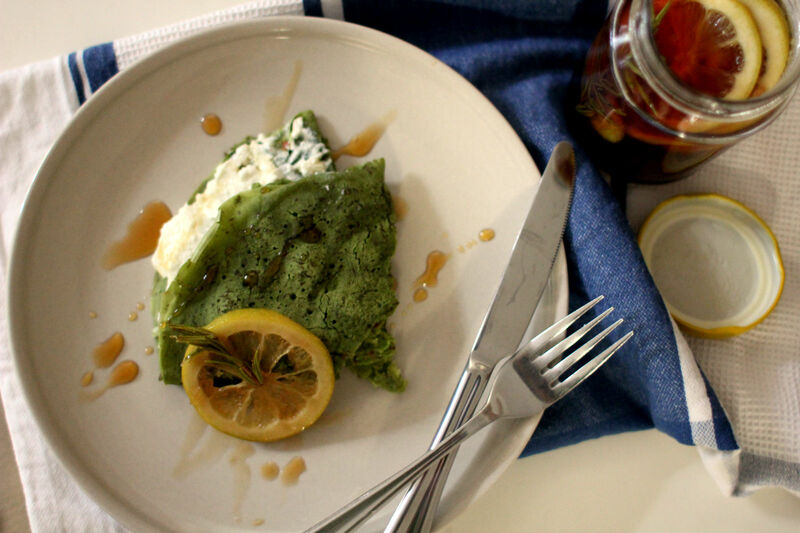 Let’s move onto this amazing green tea crepe recipe, shall we? For crepes, add flaxseed meal and water into a bowl and let it sit for 10-15 minutes until it becomes a gel form. Add other ingredients and whisk gently until you get a thin pancake consistency. Add more water if you need. Heat the non-stick pan over medium heat, add coconut oil, pour the half of the crepe mixture into the pan and swirl around so that the batter fully coats the pan in a thin layer. When the edges are crispy and lifted from the pan, it’s time to flip gently with a spatula. Crepe is really thin so it only takes a minute to cook. For the syrup, add sliced lemon, rosemary and a good quality maple syrup into a saucepan and warm it up for 10 minutes on low heat until it’s all infused. To assemble, spread cottage cheese on the crepe and fold twice. 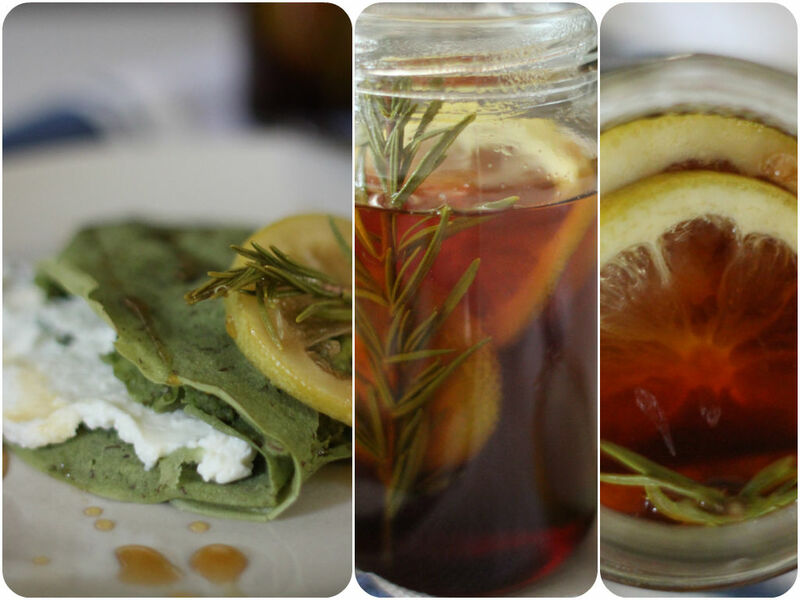 Drizzle the maple syrup and put a slice of lemon and rosemary for garnish. You can keep the leftover maple syrup in the sterilised jar in the fridge.